and there we have it folks - our wedding invitations. i spent so much time on these things, it was ridiculous. i read over every line, googled how to spell "fifteen" because it's such a weird word, and checked the spelling on "lee" about 8 times. i mean seriously, how do you mess that up? it's three letters. 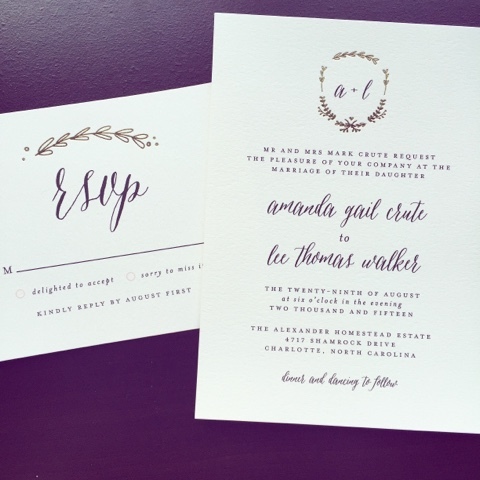 i ordered our save the dates from minted.com as well, and when it came time to do invites, i knew i wanted to use their service again. they do not disappoint. not only do they have the prettiest templates for you to choose from, you really can customize the look of the invites to make it your own. i picked out the above design, fonts, color, etc. and they are foil pressed! the gold shimmery outline i mean. i just can't get over how simple and elegant they are. two words that i can easily describe this wedding as. everything is truly coming together as we are heading into two months out and i can't wait for the day to be here! speaking of coming together, my dress is also finalized. i only had to do a few alterations at the bottom of the dress, and everything else fit like a dream. my bridal portrait session is july 29th (one month out! eek!) and i'm so stoked to be shooting with my photographer at this really awesome place that i'm keeping a secret for now. 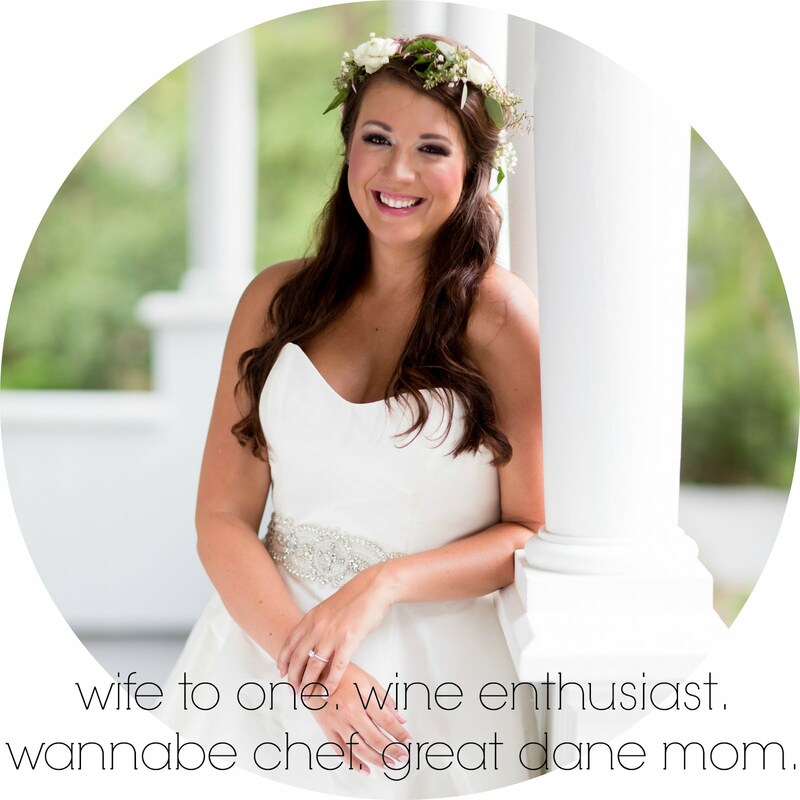 if any of your brides have advice for bridal portraits (like how to handle nerves!! ), let me know. i'm already going to be an emotional wreck. can you believe that in 2 months and 4 days we will be husband and wife? i can. want to know why i can believe it? because i've been running around like a chicken with my head cut off. i actually hate the phrase so let's pretend i didn't say that. anyway, if you hadn't noticed by how i have started my last couple of posts (or lack thereof), i have been busy. let's do a quick recap, however, shall we? lee and i were invited to 9 weddings this year; 1 being our own of course. some overlapped dates, and others we had things going on, so we couldn't make them all. 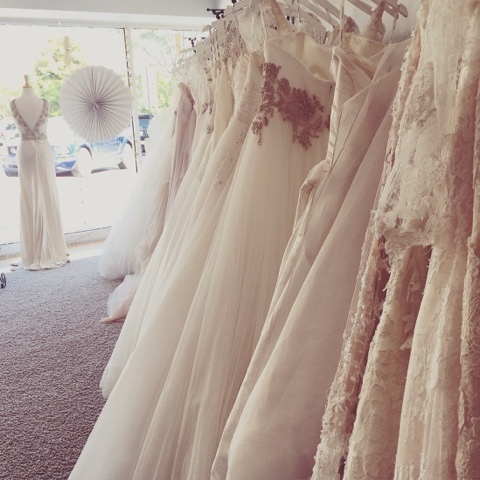 however, we are going to 7 so you can check out the #leeandamandaweddingtour on my instagram for more on that. 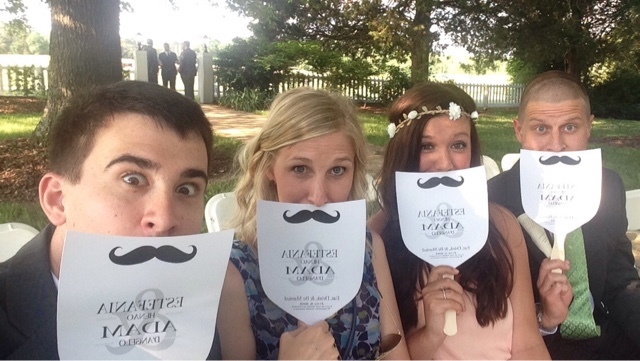 you read about katie & matt's wedding here, and this below was adam & estafania's wedding. aren't their programs so dang cute? 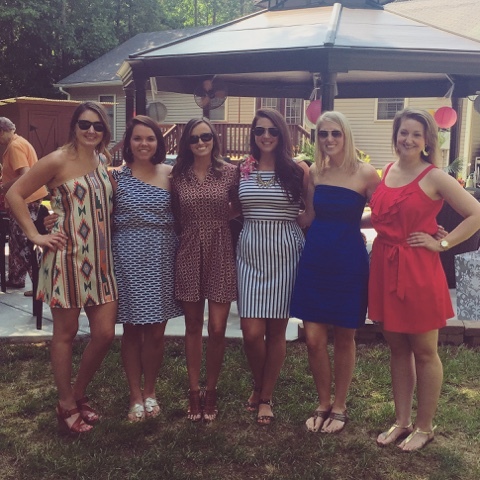 also that weekend was bridal shower number 2. this one was held at my parents house in roxboro, nc where a lot of my bridesmaids and long time friends and family came over to celebrate. lee and i played the "newlywed game" which is always lots of fun. we did good! out of all of the 20 questions, we averaged about 75%. that's passing in college right? right. 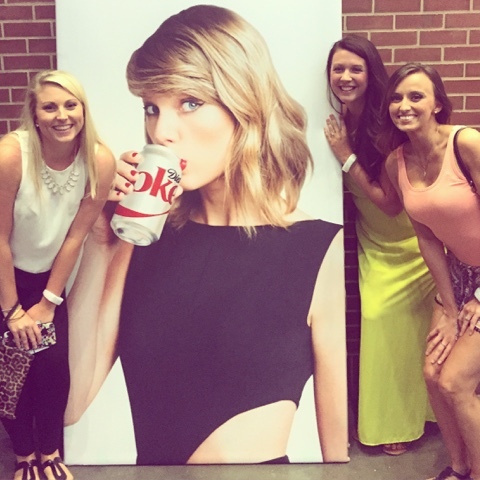 then following the shower, was taylor swifts 1989 tour in charlotte. i'm the lamest person ever because admittedly i cried several times during this show. 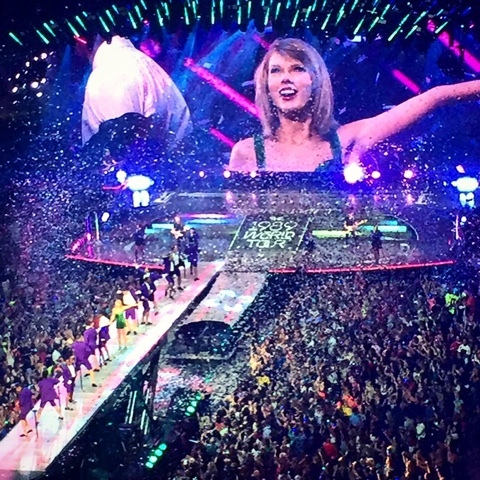 taylor has a way of captivating the crowd and not to mention putting on a damn good show. this was my 4th time seeing her (i've been to every tour), and i loved it so much, but i bought FLOOR seats to her show in october in greensboro, nc. they were pretty pricey and i didn't expect anyone to want to drop that kind of cash, so i'm going solo to the show. luckily i know a lot of people in greensboro, so i can't wait to catch up. and yes, there will be a costume this time. 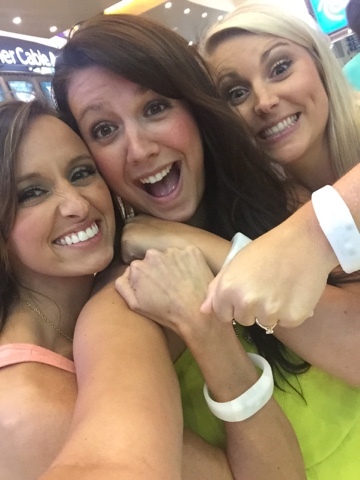 hands down one of the coolest things were the light up bracelets that everyone wore. they would vibe to the beat of the music, and changed colors through the show. if you can't tell below, we were a little excited about these. 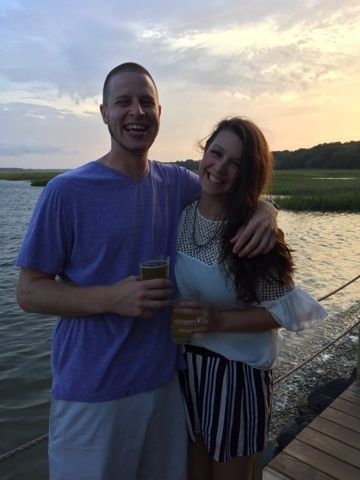 the following weekend, lee and i headed down to hilton head island for a work conference. he obtained his senior title this weekend, and i'm so proud of him and all that he has accomplished. plus a trip to the beach is always a good thing. we basically were just practicing for the honeymoon to make sure we were good at it. you know, lounging, laying out, have a few beers, and some crab legs. and finally, tomorrow is another wedding weekend. 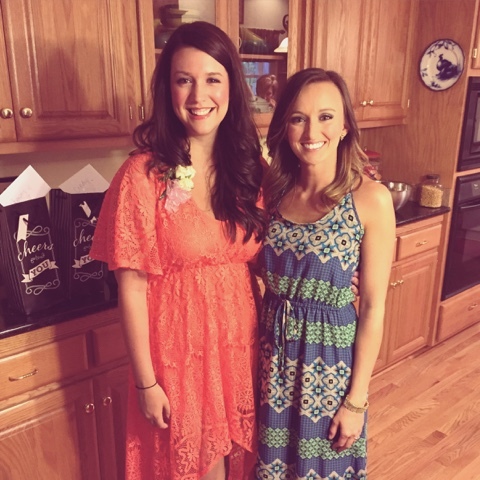 finally celebrating miss amanda & jj! we are up bright and early tomorrow to make the trek to pittsburg, pa! 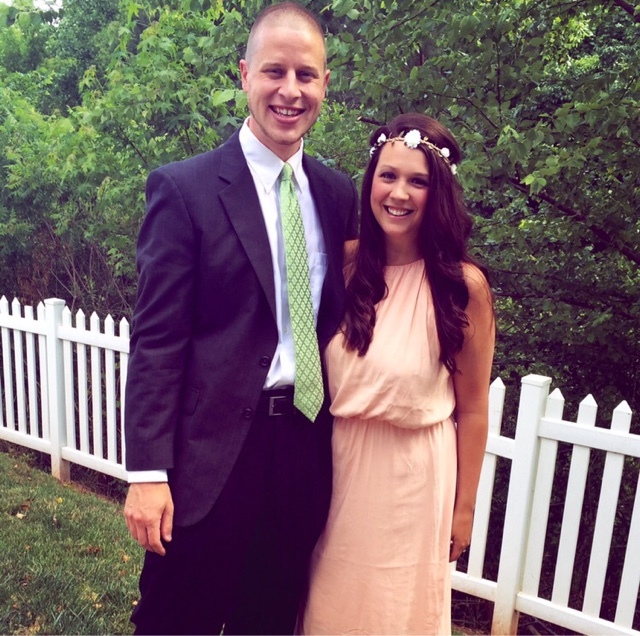 jj & amanda live here in charlotte near us, but both are from pittsburg. i've never been, so if you have any "must do" in pittsburg, holla atcha girl! we will be right in the downtown part of the area, so catch everything on instagram & snapchat (agcrute). 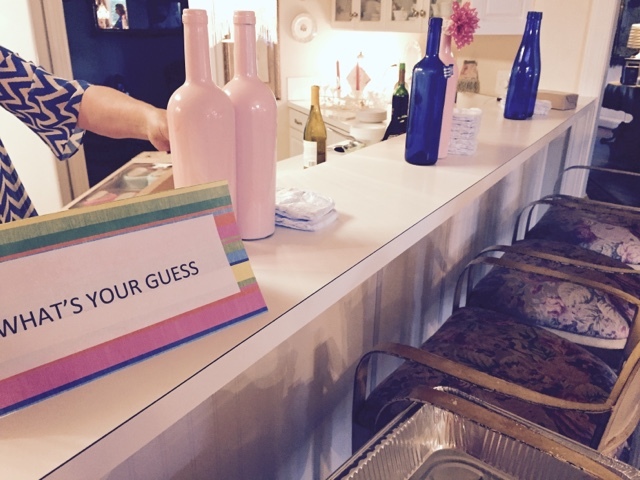 ps: tomorrow i reveal our wedding invites & my experience with minted! i know, i know. blogging two days in a row?! who do i think i am. and before you start with the congratulations.... they are not mine. can you imagine? 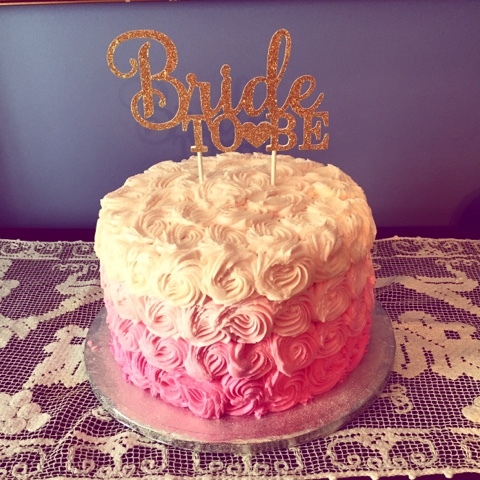 planning a wedding, 6 month homeowners and having twins?! no. no i can't. but regardless, twins are the news for one of our friends, taylor & sean! they have been married for a few years now, have an amazing home, and on this past saturday, we found out they will be bringing two fraternal baby girls in the world. 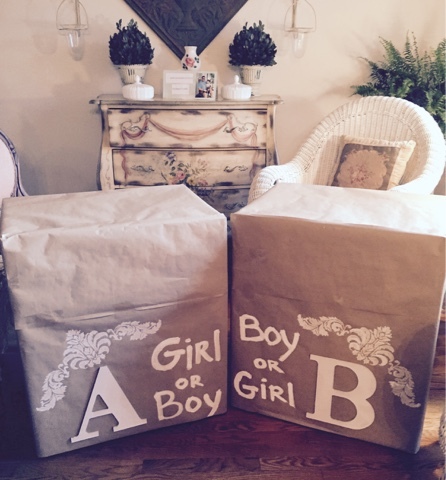 of course, i knew their gender reveal would be so cute - and with those "baby A & baby B" boxes and the "what's your guess?" diaper votes below, how could it not be? we first found out taylor and sean were having a baby around a month and a half or so ago when we were all out for a friends dinner. they looked at each other, looked at us, and placed an ultrasound picture down on the table. we all squealed as we knew they had been wanting to have a baby and then taylor said "now, look closer." on the ultrasound were not one, but TWO circles surrounding two babies. if you're anything like me, you need that circle because at this point in my life, i still cannot read an ultrasound to save my life. needless to say, we were very excited to find out the gender. at the reveal, there were various fruits/veggies that were a timeline of the baby's weight and size. have you ever seen that before? i certainly had not and thought it was such a cute idea. 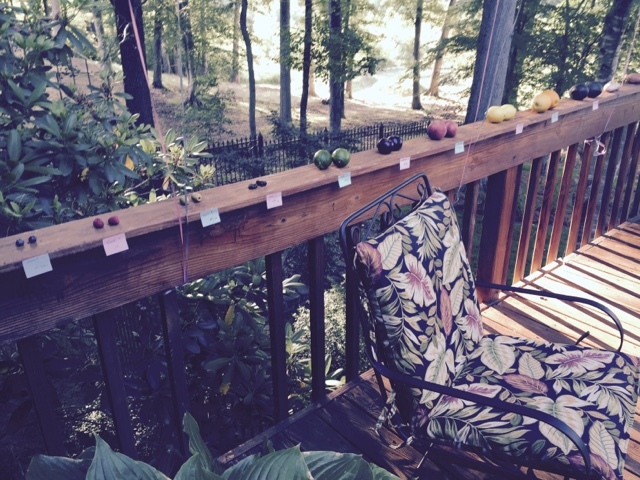 from teeny olives to bigger veggies like sweet potatoes, the girls timeline was spread out across the deck. taylor and sean knew it was two girls before anyone else did, so they let the grandmothers open one box and the grandfathers open box two. i got this on video and i promise you, it's the most adorable reaction ever. 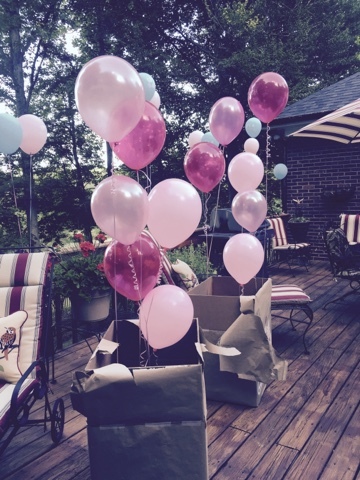 i can't wait to welcome these sweet baby girls this fall! i feel like the last few times i have posted have started with an apology for kinda being mia in the blog world. honestly, everything is just moving at a million miles an hour! 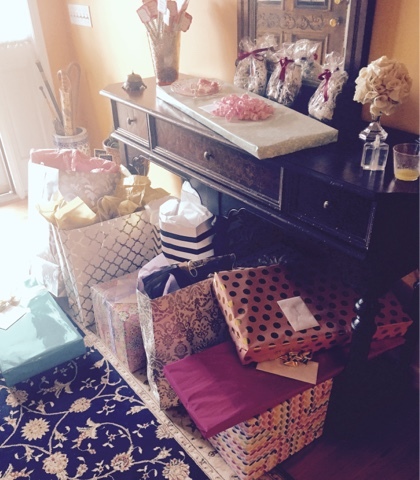 but i know for a fact, i want these important times documented so here we are with bridal shower number one. 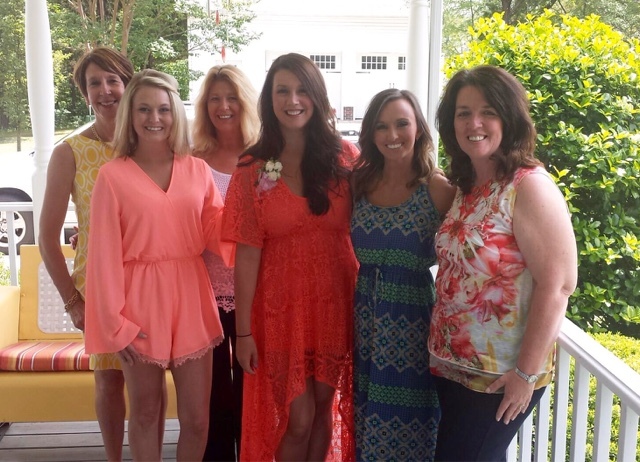 pictured left to right is laurie (lee's mom), chrissy, cindy, myself, danielle (my maid of honor), and my mom, beverly. 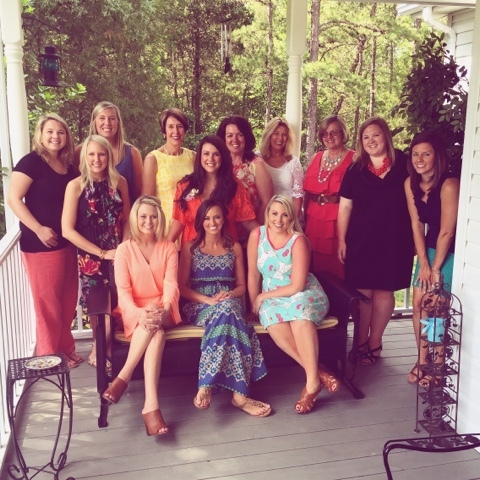 this past saturday, these ladies hosted a lovely bridal shower in my honor at lee's parents house. because we're having another this sunday, my mom decided to come down to celebrate as well. i don't think i was prepared to be as emotional as i was. tears started flowing as soon as my mom and dad walked into our own house before heading over to laurie's. i was so nervous! all eyes on you, everyone is showing you so much love, and it can be overwhelming (in a good way) to experience it all. i'm an emotional person anyway, so this was not out of the ordinary - yes, that means send prayers my way for the actual day! we walked in and i laid my eyes on this. and seriously lost it. i mean, how beautiful. it was a combination of the gorgeous cake itself, the ladies that took time to do this for me, and the "bride to be" that sat atop the cake. it was just so much awesome energy going around the room, i couldn't handle it! we got settled and people started to arrive. and let me just tell you - if it wasn't for this lady in this picture, i don't know where i'd be emotionally. 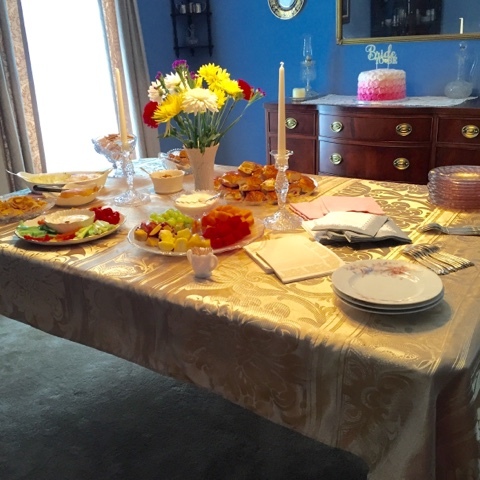 a full dining table complete with all this amazing food and desserts. we socialized, ate, drank some wine (good for the nerves!) as everyone got there with their amazing gifts for lee and i.
see what i mean? are we lucky or what? 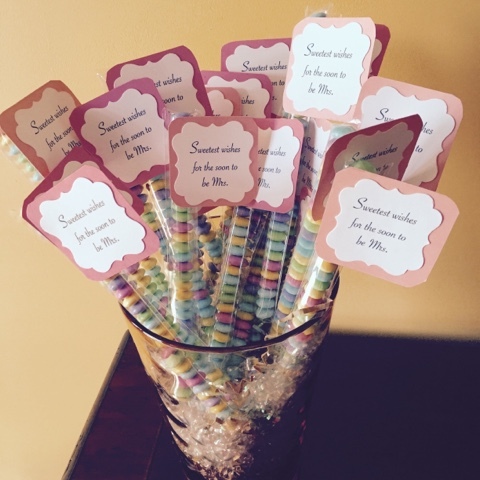 and of course these sweet little favors which said "sweet wishes from the soon to be Mrs." i probably teared up at this too. wouldn't you?! i unwrapped gift after gift and was so thankful to have these ladies below shower us with all that they did. this wasn't even all of them! thank you all so much for your kindness, love, and support as we head into the three month countdown. 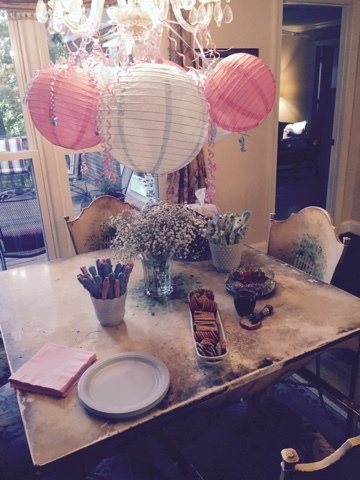 now, who wants to come to my house and help me with all these crafts?